Landmark Marina and dock side restaurant opened on May 27, 2007 located in a beautiful Lagoon at the southwest corner of Koror Island. The resort is designed with spectacular views and special consideration was made during design to keep all of the guests comforts in mind. A private dock is built for the enjoyment of our guests. The convenience of the dock allows our guests to relax while enjoying the marine activities without having to be troubled by the annoyance of transportation. Landmark Marina dock side restaurant has a 180 degree views of the lagoon and surrounding rock islands. The restaurant theme is Churrascaria (Brazilian BBQ). We also serve a la carte and table d'hote menus. The restaurant is designed with different seating areas including Japanese style balé, catering to the mood and comfort of the guests. Outdoor seating is also available. 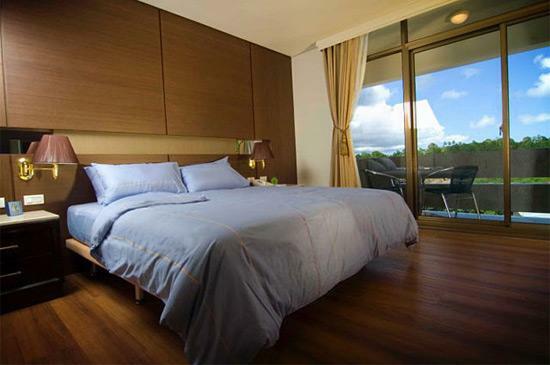 Dark colored wood mixed with beige and pastel colors is the decor theme of our rooms. Our special selected feather bedding and SLUMBERLAND English mattress awaits your arrival. Comfortable deck chairs on your balcony relaxes you throughout your stay. Dark colored wood mixed with beige and pastel colors is decor them of our rooms. Our special selected feather bedding and SLUMBERLAND English mattress awaits your arrival.